There's clearly interest in a device that converges the tablet and notebook. ASUS saw some of the earliest success in this department with its Transformer line of Android tablets. Once the first Windows RT/8 designs started appearing, it became clear that everyone was aiming to deliver something that delivered the best of both worlds. Even listening to Intel's description of Haswell you can get a good idea for where part of the industry is headed: everyone is working towards delivering a platform/device that has the battery life and portability of a tablet, but with the performance and flexibility of a notebook PC. Apple has remained curiously quiet on this front, but I suspect that too will change in good time. Last year Microsoft unexpectedly threw its hat into the ring with quite possibly the best branding decision since the Xbox. 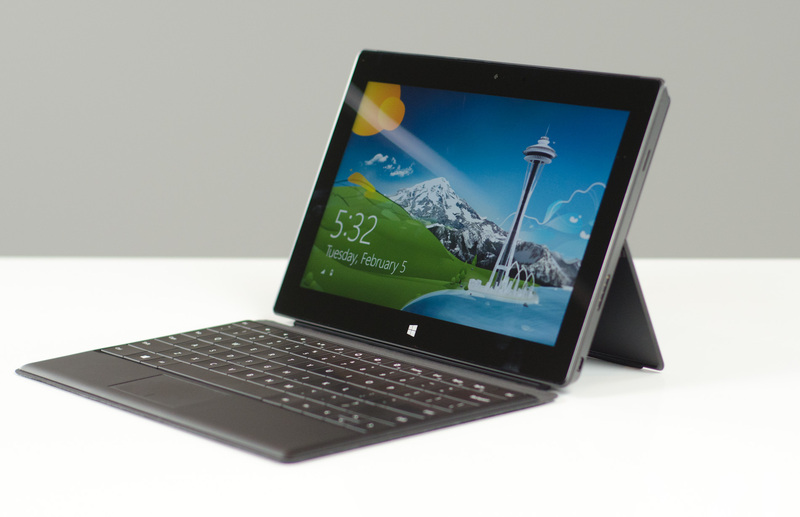 Under the Surface brand, Microsoft would produce two tablets of its own. These Surface devices would be built from the ground up to address this converged tablet/notebook space. The lesser of the two, Surface for Windows RT, would use ARM hardware and serve as a launch vehicle for Windows RT. The big brother in the family, Surface for Windows 8 Pro, would use traditional x86 hardware and come around 3 months later. Surface RT launched less than four months ago to mixed reviews. I saw potential in the device, but it needed faster hardware and honestly Windows RT needed some sanding around the edges. 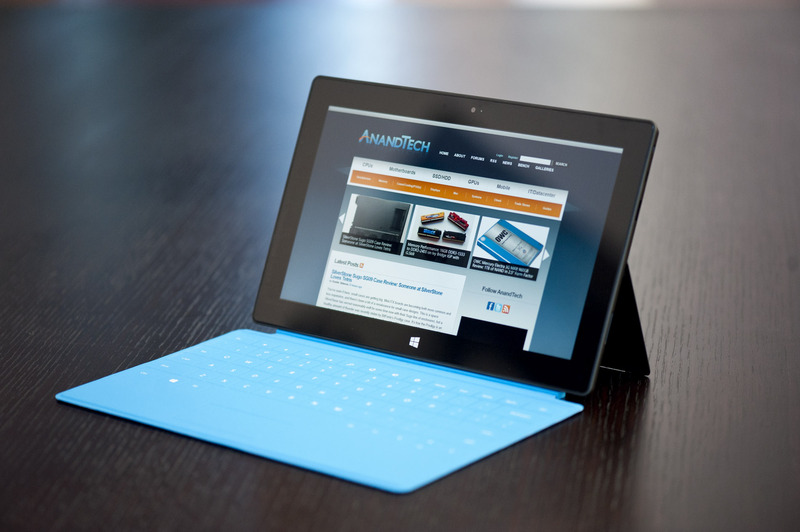 Today we have the official introduction of Surface Pro. With a higher price, thicker/heavier chassis and lower battery life, could Surface Pro possibly fare any better than Surface RT did last year? In my opinion? Surprisingly, yes. Let's get to it. The heart and soul of Microsoft’s Surface Pro is a 17W Intel Core i5-3317U (Ivy Bridge) processor. This is a two core/four thread part with Intel’s HD 4000 graphics and a 3MB L3 cache. Microsoft told me that it simply used the best hardware available when designing Surface Pro, which likely means that it didn’t get early access to any of the 7W SDP Ivy Bridge SKUs (the Intel/Microsoft relationship has seen better days, Intel isn’t super happy about the whole Windows RT thing). 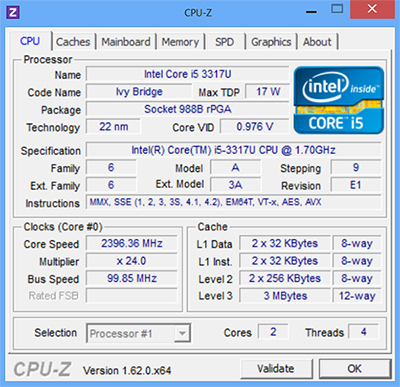 The i5-3317U finds its way into Surface Pro unimpeded. In power saver mode without being plugged into the wall it’ll run both cores at 800MHz just like any other Windows notebook, but in balanced mode you’ll find the cores will start doing work at a 1.7GHz base clock and turbo all the way up to 2.6GHz (and beyond, for short periods of time). This is the same level of CPU performance you can get in most Ultrabooks, and the exact same hardware that’s used in Apple’s 11-inch MacBook Air by default. I won’t spoil the fun, but it’s considerably faster than what you’ll get in any ARM based tablet. That includes Google’s Nexus 10, Apple’s iPad 4, and of course Microsoft’s own Surface RT. The performance advantage doesn’t stop at the CPU either. Microsoft integrated 4GB of DDR3-1600 memory (dual-channel, soldered on-board) and a full 64GB or 128GB SATA based SSD into Surface Pro. While Surface RT used a single chip eMMC solution, Surface Pro uses a 6Gbps SSD similar to what you’d find in an Ultrabook, MacBook Air or even some desktops. I’ll get to the deltas later in the review, but we’re talking a completely different league of performance here. The usual tablet bells and whistles are all still here: WiFi, Bluetooth 4.0, ambient light sensor, accelerometer, gyroscope, compass, front and rear facing cameras. The only missing checkbox is the lack of any cellular connectivity. Both of Microsoft’s tablets remain WiFi-only at this point. Surface Pro comes with a 10.6-inch capacitive touch screen and it runs Windows 8 Pro, meaning it not only runs everything that Surface RT can run, but it also runs all of your legacy Windows applications. Look around the edge of Surface Pro and you’ll find a miniDP output and a USB port. Has the lightbulb gone off yet? Surface Pro has the same underlying hardware as a notebook PC and it has the basic connectivity you need - this is the first tablet that can truly replace your tablet, notebook and desktop if you want. No compromises, no new apps, and no waiting for Flash to die and HTML5 to take over. Surface RT was Microsoft’s first attempt at a convergence device, but Surface Pro really is the first tablet that truly attempts to replace a PC and not just augment it. All of this of course comes at a price. The CPU from Intel alone retails for $225, that’s over half the price of a Nexus 10. Surface Pro has Ultrabook insides and it’s priced accordingly. The 64GB model retails for $899, while the 128GB model is $999. Compared to similar capacity iPads, you’re looking at a $200 premium. Although to really get full use out of Surface Pro you need either the $119 Touch Cover or $129 Type Cover, so adjust those prices accordingly.